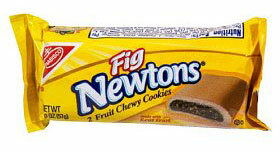 In 1891 the fig cookies were named "Newton" after the town of Newton, MA. Newton-Wellesley Hospital is located at 2014 Washington Street in Newton. U.S. News & World Report ranks the hospital 13th best in the Boston metro area. The Green Line "D" Branch, (the Riverside branch) is a rail line that runs through the center of the city that travels to downtown Boston, ranging from 10 to 30 minutes away. The Green Line "B" Branch ends across from Boston College on Commonwealth Avenue, virtually at the border of Boston's Brighton neighborhood and the City of Newton. The MBTA Worcester commuter rail, serves the northern villages of Newton near Waltham, offers less frequent service to Boston. It runs from every half-an-hour during peak times to every couple of hours otherwise. Heartbreak Hill, notably challenging stretch of the Boston Marathon, on Commonwealth Avenue between Centre Street and Boston College. Bullough's Pond is an old mill pond transformed into a landscape feature when Newton became a suburban community in the late nineteenth century. Chestnut Hill Reservoir is a popular park with residents of Newton, Brookline, and the Brighton section of Boston. Although completely within the Boston city limits, it is directly contiguous to the Newton city limits. The park offers beautiful views of the Boston skyline, and is framed by stately homes and the campus of Boston College. The Jackson Homestead, now the Newton History Museum at the Jackson Homestead, is best known for its history as a stop on the Underground Railroad.